My name is Dema Kohen. I'm a native Ukrainian, turned American citizen, who has a passion for ministering, not only to children, but to those who minister to children. I share the following pieces of my life story as a means of letting you get to know me a little better, and hopefully inspiring you to remember that God has all of our life story in His hands, both the good and the bad. 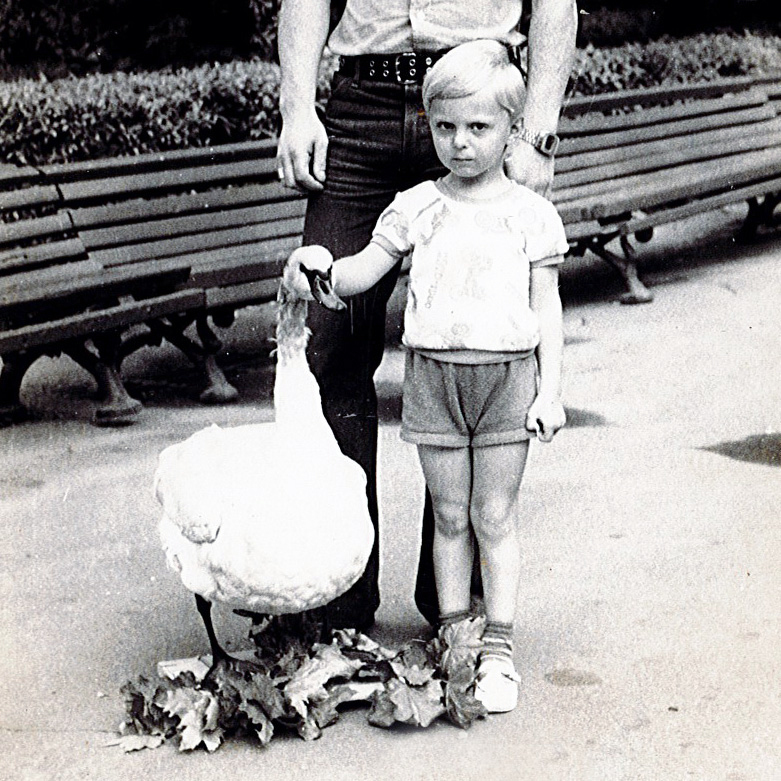 This little boy..this sad little boy in short little shorts next to a goose. Yep, that’s me. This is the beginning of my story. I was born in a country that no longer exists. The implosion and collapse of the Soviet Union was worldwide news when I was 16 years old. You would think it would be the defining moment of my childhood; the day that my country became independent Ukraine again. Unfortunately it was not. You see, 10 years earlier, in an event mostly hidden from the eyes of the world, my little family had imploded and collapsed. My father, my hero, abandoned my mom and I. He walked right out the door and didn’t look back. I learned first hand the effects of rejection, abandonment, shame and loneliness in the heart of a child. I withdrew from people and grew up in silence. During those days, there was a faint dream that God placed into my heart. I dreamed of becoming a US citizen..to be fair, I think it was everyone’s dream during those days. I would love to say it was the thought of freedom that beckoned my name but more accurately, it was sky scrapers and bubble gum. It was an impossible dream. Just like everything else in my life. When I turned 14, my mom started dragging me to church. Even as an unbeliever she was wise enough to know that it was the safest place for a teenager. It didn’t take long before I fell in love with Jesus and gave my life to him. Soon I felt the Holy Spirit nudging me to get involved. So I joined the choir. If you’ve ever heard me sing, you know that didn’t last long. Let’s just say, I needed to find a better avenue to serve. So I made the next logical step and decided to work with kids. In those days, persecution toward Christians had just ended and the church which had been operating in survival mode for decades, was suddenly flocked with new believers. It was a wonderful time of renewal and revival for the church. There was just one problem. There were no resources, no training, no concept even of what ministry to children should look like. In those days I relied on the Holy Spirit and whatever objects I had within my grasp to teach with…a rock, a twig, an apple. In retrospect, it was the best training I could have ever received. The Holy Spirit was my personal mentor and imagination, my right hand man. In those years I became passionate about the English language. My mom miraculously got ahold of a English textbook (books like this were not readily available in the Soviet Union) and I devoured it. I started translating for American missionaries at the age of 17. I never would have imagined that God was preparing the way for my childhood dream to become reality. Fast forward about 20 years. I found myself visiting America. I had been in ministry my whole life. Ministering to children. Pastoring a church. Soul-care counseling. Traveling a lot. I was recently widowed and feeling lost. I never doubted that God was in control but my life looked a whole heap out of control. I wouldn’t have written this story for myself. After months of grappling with God on American soil, I found peace. I was ready to head back to Ukraine, back to a life of ministry. And wouldn’t you know, just a few days before my return flight, I met a girl. Not just any girl. She was my girl. I knew it from the moment I laid eyes on her. God just whispered it into my heart. 10 months later we said “we do” at the edge of a beautiful lake in Moneta, VA. Turns out my time in Ukraine was over. God closed the door on that chapter of my life and started writing on a fresh new page - in America. God answered the heart cry of that little Ukrainian boy. It’s been six years and two babies since that fall day at the lake. I’ve spent five years in children’s ministry here in the States. After years of ministering to broken adults, I decided that ministering to children was my passion. Not because I don’t love broken adults but because I want to see more whole adults. Adults whose wounds were bound up in childhood and covered by the grace of Jesus. That is my mission, my passion, my calling from God. And I’m guessing it’s yours too. That’s probably why you are here.